It’s that time again. No, not Waluigi Time, although that’s close. It’s time to give my early impressions on a video game, and this time it’s Mario & Luigi: Dream Team. There’s a lot to like about these Mario role-playing games. They tend to have good characterization, they’re amusingly corny, and they generally have coherent stories. From what I’ve heard, Shigeru Miyamoto, who’s mostly focused on gameplay, has actually pushed for LESS story and character, which is kind of weird. I mean, nobody expects an epic plot from Super Mario, but most of them bring some extra depth to the Mushroom World. The original Super Mario RPG centered around a threat so significant that Mario and Bowser had to team up to defeat it. It’s an old trope, but it’s effective. 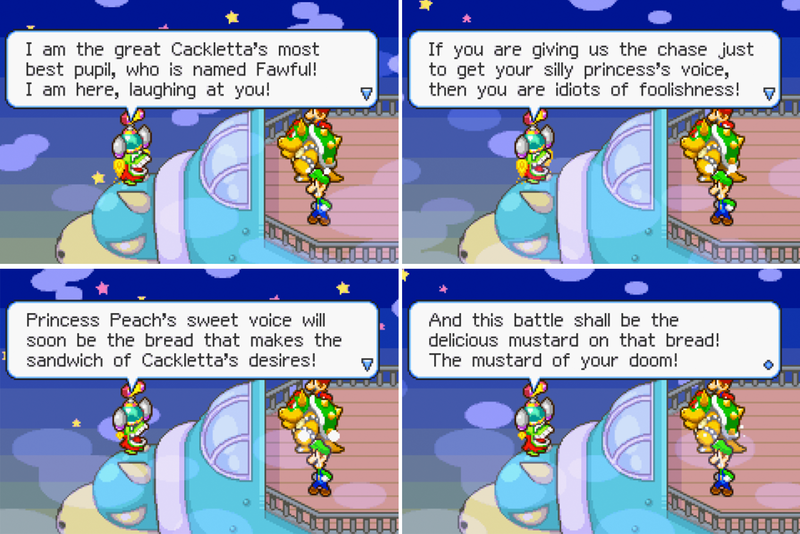 Mario & Luigi: Superstar Saga had Cackletta and Princess Peach coming up with their own complex plans, with the Brothers and Bowser caught in the middle, and exploration of a new setting in the Beanbean Kingdom. 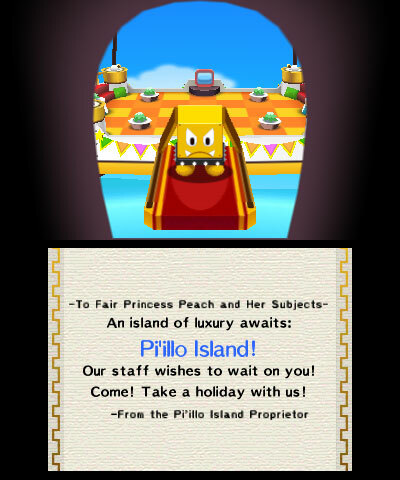 In Dream Team, Mario, Luigi, Peach, and Toadsworth are invited to a sleep-themed place called Pi’illo Island. 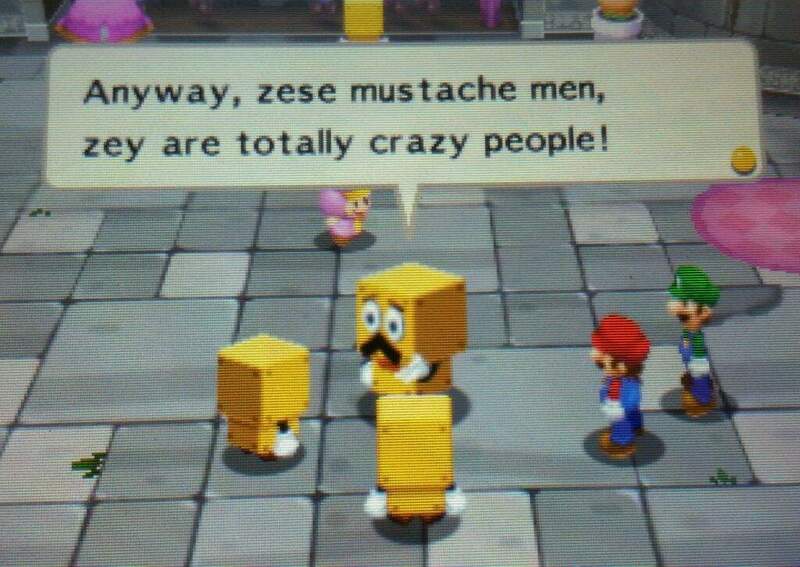 They’re welcomed by Broque Monsieur from Bowser’s Inside Story, a man made of blocks who speaks in a silly French accent. If the back story of the original Super Mario Bros. has it that Bowser turned the Toads into blocks, are the Brock people transformed Toads? Okay, probably not. The Marios find out that the former inhabitants of the island, who had their own kingdom, were transformed into actual pillows by the Bat King Antasma. Luigi’s sudden onset of narcolepsy (Toadsworth, with his old-fashioned vocabulary, calls him a slugabed at one point) makes him able to use the pillows to create portals to the Dream World. The control in the game is basically the same as in the other Mario & Luigi games. Combat is turn-based, but you can use well-timed button presses to add oomph to an attack, and to dodge or counterattack. In the waking world, you control Mario and Luigi separately, and there are special moves that use both of them. 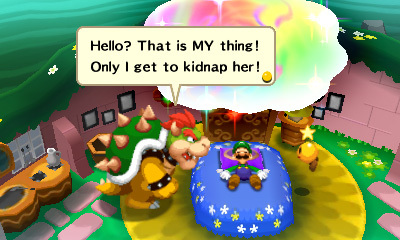 In the Dream World, Mario is accompanied by Dreamy Luigi, who is more confident than his normal self. He can interact with various scenery, and doesn’t directly participate in battle. He can, however, sometimes help out if you make the correct moves. 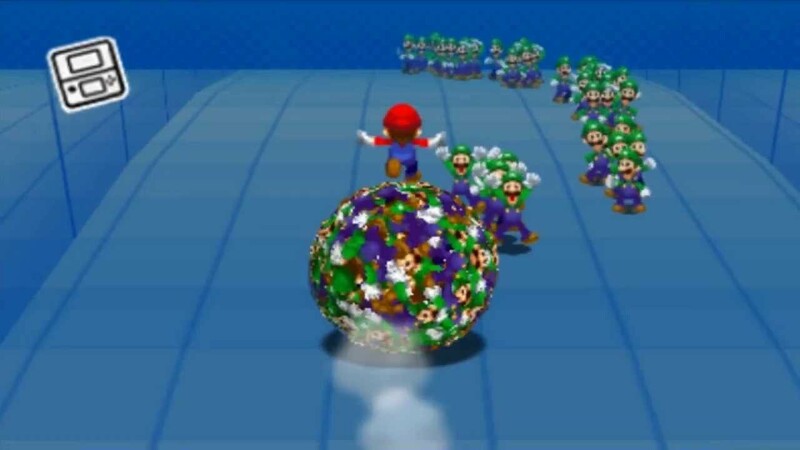 There are also Luiginary Attacks, in which tiny versions of Dreamy Luigi form into a shape to help out Mario. The only one I’ve been able to access so far is the Luiginary Ball. Forming the ball requires tilting the 3DS itself, something I’m still not really used to. The farthest I’ve gotten in the game is to the point where Antasma teams up with Bowser, leading to a difficult battle. At least, it’s difficult for me. Antasma forms a group of bats around the Koopa King, and if they hit Mario, they’ll transfer the hit points they take from him to Bowser. And if you kill any of the bats, they’ll return in the next round. Bowser himself both charges at Mario and breathes fire. There’s a lot going on, and while I can sometimes get the timing right to dodge, I mess up often enough as to keep dying. It gives me the option to try again in easy mode, and while I might eventually resort to that, it kind of seems like cheating. Then again, there have been plenty of games I’ve played where there’s one part that’s really hard, followed by most of the rest being doable. I had much the same problem fighting the first boss in Inside Story, the Stone Blooper, who could only be harmed by counterattacks. Bosses are supposed to be harder than the rank-and-file enemies, but in both these games it just seems like there’s TOO much of a difficulty spike too early on. I guess all I can do is keep trying, but I’ve currently set Dream Team aside at least for the time being. This entry was posted in Dreams, Humor, Magic, Mario, Monsters, Video Games and tagged antasma, brocks, broque monsieur, dreamy luigi, king bowser koopa, luigi mario, luiginary attacks, mario and luigi: bowser's inside story, mario and luigi: dream team, mario and luigi: superstar saga, pi'illo island, princess peach toadstool, shigeru miyamoto, super mario rpg, toadsworth. Bookmark the permalink.